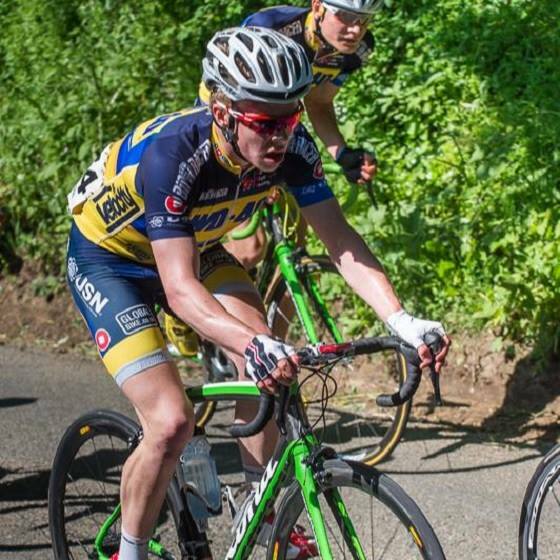 Matt Gibson followed on from his first Tour Series show down with a great performance at the Loughborough University Junior Road Race in Leicestershire, narrowing the gap in the National Junior Series by taking the victory on Sunday. 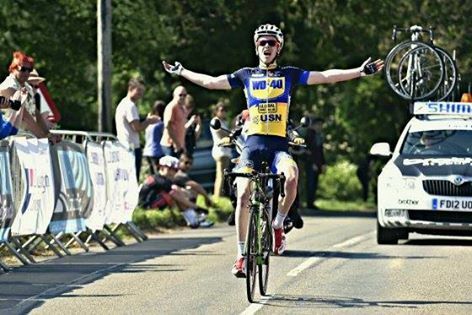 Gibson, previously third, beat series leader James Shaw (Haribo Beacon) to the line at the end of the 68-mile race near Melton Mowbray. Still 32 points behind Shaw, the win moves Gibson above Haribo Beacon’s Joe Evans into second place in the series. It was Shaw’s team mate Tom Baylis who made the early running – making a solo break on the second lap of the circuit but he was joined by Oliver Maxwell of Windmill Wheels Cycling Club, Lincoln winner Joe Wiltshire of NFTO Race Club and Elliot Reynolds Clay Cross Road Team for the second ascent of the finishing climb. They had a 75 second lead over the main bunch with Zak Loney of LFH Team in no man’s land attempting to bridge the gap to the leaders. Alexander Braybrooke of Velocity WD-40, Charlie Tanfield of Adept Precision RT/NE Healthcare, and Leon Mazzone of Team Isle of Man led next time round with a lead of a bike length or so over a large bunch containing Walker, Fry, Maxwell, Baylis, Lovibond and Spedding. From first to last the leaders were separated by just 40 seconds. In the key move of the race, Gibson and Shaw joined the now consolidated lead group on the run up to the bell with Baylis, Mazzone, Fry, Robbins, Braybrooke, Hogg, Williams, Lovibond, Maxwell, Spedding, Walker, Holt and Grieve still together and Tanfield and Wiltshire slipping off the back. Alex Braybrooke made a move on the final lap but was chased down by Shaw, Gibson and Spedding and it was this quartet that made the final break with Gibson riding away at the base of the final climb. Shaw had no answer and rolled home 43 seconds back with Braybrooke a further four seconds back, five seconds ahead of Spedding. Matt Gibson spoke to British Cycling after the event: “Early on, a few breaks were going up the road – the race was a bit neutral in the bunch, nobody was really doing anything, letting the breaks go up the road – Tom Baylis, who’s a very strong rider – got up the road early on. That was quite worrying. But I just kind of relaxed and just knew that later on in the race, people would tire and it would be easier to bridge across. “With two to go me and James (Shaw) managed to get across to a group of five that was further up the road and we then joined with the front group on the road – a group of about 20. My team mate Alex (Braybrooke) did a brilliant job – me and him one-two in the break, making some people hurt up there”. “With about three quarters of a lap to go, Alex got off the front. A Scottish lad joined him and then with about a quarter of a lap to go me and James bridged across making a group of four.